Henry Ford Health System in Detroit today announced it now supports Health Records on iPhone, which brings together hospitals, clinics, and the existing Apple Health app to make it easier for patients to see their available medical data from multiple providers. In Health Records, patients can see their medical information from participating institutions organized into one view. The app covers allergies, conditions, immunizations, lab results, medications, procedures, and vitals. Users also will receive notifications when their data is updated. Health Records data is encrypted and protected with the user’s iPhone passcode, Touch ID, or Face ID. Patients can enroll through the “Health Records” section of Apple’s Health app. 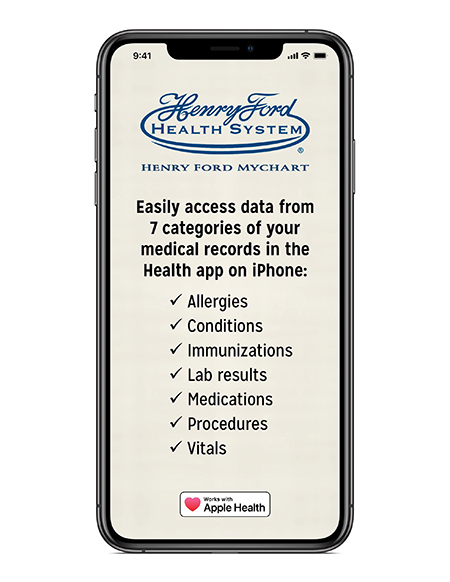 Once they select Henry Ford Health System, users will be prompted to enter their Henry Ford MyChart login and password, and authorize the release of their health records to the Health app. In addition to providing patients with another digital option, Apple’s Health Records can also be an added resource when patients are communicating with providers. Having information immediately available offers enhanced ability to provide patient care. To learn more about how to access Henry Ford patient records using the Health Records, click here. For more information on Health Records, click here.